Visits at ITER are one of the best ways to establish, and maintain, a close relationship with the public. School children, university students, industrial representatives, members of the general public and government officials—close to 15,000 visitors in all—came on site in 2016, bringing the cumulative number of visitors since 2007 to 114,927. In 2016, a total of 591 visits were organized and nearly 15,000 visitors welcomed. A new on-line tool is now available for the reservation of individual or group visits. Visits can be divided into three categories. Educative visits for school children and universities (46 percent), with educational workshops on energy and ITER site biodiversity, are managed by Agence ITER France—an agency of the neighbouring Commissariat à l'énergie atomique (CEA). The rest—visits for the public and the media, as well as VIP visits—are organized by the ITER Organization. How does it feel to step into the heart of the most ambitious scientific project of the world? 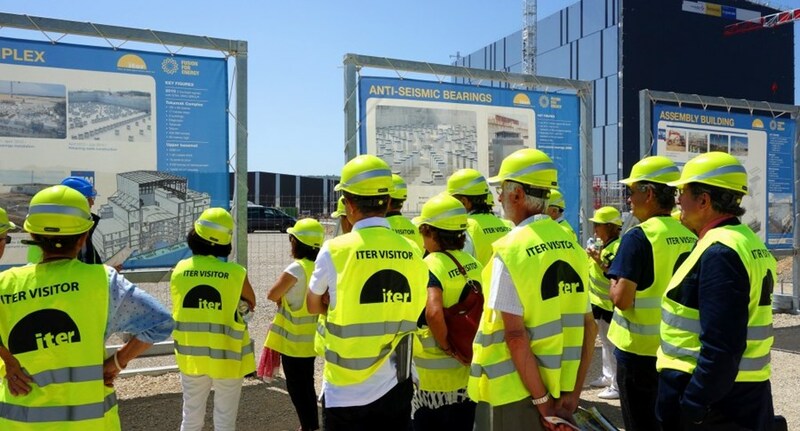 A visit to ITER generally includes a presentation on the project at the Visitor Centre and a drive on the construction platform. When ITER first opened its doors to the public in 2007, site preparatory works were underway. Those works consisted mainly in the clearing and the levelling of a vast platform to house the 39 buildings and technical areas of the ITER installation. Year after year, as construction progressed, the platform had more and more to offer to the eyes of visitors. The Poloidal Field Coils Winding Facility and the early phases of the electrical switchyard in 2011 ... a new Headquarters building for the ITER Organization in 2013 ... and of course, the foundations of the spectacular Tokamak Complex. More recently, the Cryostat Workshop was completed in 2014, followed by the huge Assembly Building in 2015. Now, with 1,500 workers active on site and construction projects mushrooming in every corner, what used to be a vast and empty platform has become one of the largest construction sites in Europe. If you are interested in a site visit, click on this link to access to our new on-line booking system.